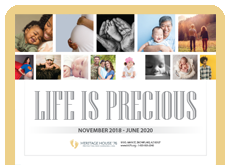 Description: This great addition to our Pro-Life jewelry selection includes a silver ring inscripted with the words "Life is Precious" that hangs from a black cord bracelet. I bought this bracelet (along with two others) for my friend. She loved it! It works with virtually every outfit, since the cord is black and the ring is silver. The message is simple yet powerful. The only criticism I have is that the ring can rotate around the knots, so the message isn't always visible. I would still definitely recommend this product, though! This bracelet is a great compliment to the matching necklace. The cord has held up very well for over a year & the metal hasn't tarnished at all.